Jean-Pierre Amoakon took third place in the category Oral Presentation/Engineering at the recent annual meeting of the Kentucky Academy of Science held at Western Kentucky University. Amoakon is a senior chemistry major with a minor in biology from Abidjan, Côte d'Ivoire (Ivory Coast). He enrolled at Georgetown College in 2016. More than 600 scientists and students attended the 2018 annual meeting. Hundreds of students from Kentucky and regional colleges and universities participated in the research competitions. Jean-Pierre’s oral presentation was based on senior seminar research and entitled “High-Throughput Microfluidics to Characterize Subtle Synaptic Phenotypes in C. elegans.” In his research, he sought to characterize how synaptic distribution and genetic variations impact behavior. 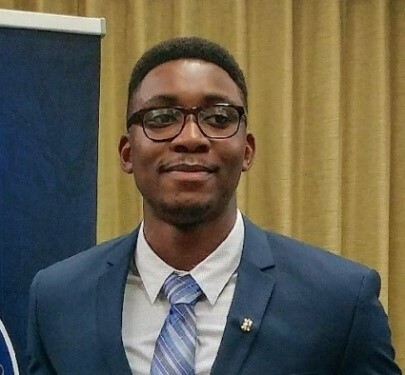 Over this past summer, Jean-Pierre did research at Georgia Institute of Technology. He hopes to earn a PhD in neuroscience. At Georgetown, he is a member of the Honor Society Phi Kappa Phi and a member of Pi Kappa Alpha Fraternity. The Kentucky Academy of Science is a non-profit organization, founded in 1914. Its mission is to foster scientific discovery and understanding in Kentucky. More information on KAS is available online: www.kyscience.org.